These documents are provided on this web site as a matter of general interest and to aid in research by individuals. No permission to reproduce or transmit them is implied or granted. 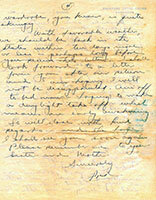 Fred Noonan wrote many letters back to the States during the World Flight. Many were written to his wife, Mary Bea. 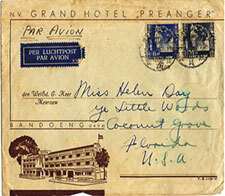 Others went to friends scattered about the country, including Helen Day, of Coconut Grove, Florida. She kept the letters her whole life. Helen Day’s son, Jim Bible, has been gracious enough to scan the original letters and send the scans to us for use by researchers. 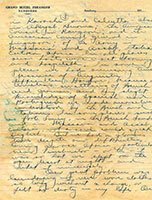 To aid in comprehension we are including a transcription with each image. Each letter has its own page. Scroll to the bottom of the page to access the other letters. 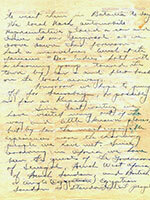 Fred’s third letter was written from Bandoeng, Java. It is strange how some times thoughts of one person will run through one’s mind all day – to-day thoughts of you continually through my mind. And so I decided to write you a letter before going to bed. We have been so out of touch with the world since leaving the States I am afraid I’ll only be able to write of our doings – and they have been uneventful – you’ll probably be bored stiff. We arrived here yesterday from Singapore – and as some minor instrument adjustments were necessary we decided to remain here an additional day. It proved a most interesting day indeed. to visit them in Batavia to-day. The local Nash automobile representative placed a car and driver at our disposal – so we drove down this forenoon – had a marvelous lunch at the famous “Des Indies”t hotel with a charming group – toured the town by car – and flew back on the local airways. 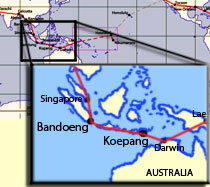 Tomorrow we hope to jump off for Saurabaya, or possibly as far as Kupang. in Karachi and Calcutta – also in Akyab, Burma; the American Consul in Tangoon, and the American Consul General in Singapore; of the Army in Massawa and Assab, Italian Eritrea, Africa. In all places our hosts were most charming and hospitable. In some places we had amusing times because of linguistic difficulties. However, because of Amelia’s smattering of French and German, and my slight knowledge of Spanish and Portuguese we made ourselves understood by the French and Italians. In some places – such as Fort Lamy, in the French Soudan and in Massawa and Assab, Eritrea, not a soul could speak English. But we had a glorious time despite our difficulties. Coming across Africa – particularly near Timbuctoo – or “tu” – it was so hot we slept on the open desert at night – and liked it immensely. wardrobe, you know, is quite skimpy. With favorable weather, we should be back in the States within ten days more or less – perhaps long before you receive this letter. 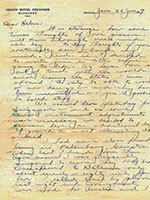 I shall look forward to a letter from you after our return and I am hoping I will not be disappointed. Am off to bed now – hoping to make a daylight take-off – which means an early awakening. So will close with kind regards – and the hope I shall see you soon again. Please remember me to your Sister and Mother.